Burn injuries are one of the leading causes of unintentional death in the U.S.
• First-Degree burns are identified by pain, redness, minor swelling and an absence of blistering. • Second-Degree burns produce a slight thickness of the skin and may include blistering; indicating damage may have been done to the underlying layers of skin. • Third Degree burns feature leathery, waxen skin and are commonly accompanied by numbness due to full thickness damage to the skin and surrounding nerves. • Fourth-degree burns have extended past the skin layers and into muscles, tendons or bones, causing charring and irreparable damage. Many burns occur at home while cooking, mostly because they can happen suddenly. • Get in the habit of using oven mitts when removing things from the stove or oven as these are made to protect the back of your hand as well. • Never touch the stovetop with bare hands because you may not know if the burners are still hot or not. • Be mindful of splattering hot liquids onto your skin, removing lids from the microwave, or when draining pasta as the steam can also burn your hands. • A good way to protect yourself and your family while you are cooking is to always keep the handle of the pot or pan turned inward. You never know if and when your child could pull the pot of hot food down on top of them. When treating a first-degree burn at home, always remember to cool it and check it. 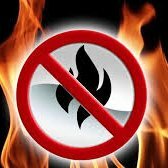 Remove any clothing or jewelry near the burn and immerse the affected area in cool water for 10 minutes. Never apply ice or cold water, this slows the blood flow to the area and can damage the tissue. Next you’ll want to gently wash the area with soap and water and cover it with a clean cotton material, which will help to reduce the risk of infection. Keep a watchful eye on the burn and make sure to leave any small blistering alone. If you see a large burn area, a lot of blistering or any of the signs or third- or fourth-degree burns, call 911 immediately. If someone else has been in a fire and inhaled smoke, call 911 immediately. As always, if you have any questions, feel free to call your friends at Carbondale Fire. We hope these tips will help keep you and your loved ones safe all year long.